The Indian Railways will call tenders to award contracts to set up 3,000 mw of solar power projects on its unused land, rail and coal minister Piyush Goyal said. State-run lignite miner and power producer Nyveli Lignite Corporate India will also bid aggressively for the contracts, the minister said while addressing the media on Tuesday. NLC entered the renewable energy sector with the commissioning of a 140 mw solar photo voltaic power plant at Neyveli and another 51 mw wind energy plant, also in Tamil Nadu. “In renewable energy, they already have about 191 mw today. It will become 300 mw by March 2018 and by 2025 it’s actually 4,251mw that they are planning. So almost 24% of their 13,700 mw capacity will be renewable energy,” the minister said. 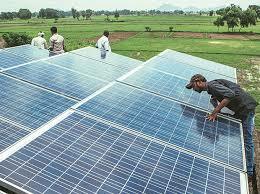 Union minister Piyush Goyal said state-owned NLC India plans to aggressively bid for Indian railways’ solar projects. “Indian railways plans to have a bidding process to soon come out for expanding solar footprint of railways where NLC India Ltd is also having very aggressive plans and will be bidding very aggressively to try and get those contracts through the bidding process,” the Railways Minister told reporters here. The company, he said, was now investing in solar projects so that it becomes a serious player in the renewable energy sector. “They (NLC India) are also having discussion and dialogues with Indian Railways,” Goyal, who also holds coal portfolio, said. The company forayed into the renewable energy sector with the commissioning of a 140 mw solar photo voltaic power plant at Neyveli and a 51 mw wind energy plant in Tamil Nadu. “In renewable energy, they already have about 191 mw today. It will become 300 mw by March 2018; and by 2025 it’s actually 4,251 mw that they are planning. So almost 24 per cent of their 13,700 mw will be renewable energy,” the minister said. The minister also urged the West Bengal government to accord approval for transfer of DVC’s Raghunathpur power project to NLC India Ltd. “There is also a discussion going on…for transferring the Rahunathpur power plant from DVC to NLC India Ltd for which we are awaiting approval from government of West Bengal for almost two years…I would urge the West Bengal government to give us approval so that we can transfer the Raghunathpur power plant,” Goyal stressed. “If they (West Bengal government) had given us permission two years ago by now we would have actually started Raghunathpur plant and it would have started serving the people of India,” the minister said. NLC India posted a 96% increase in net profit at Rs 2,368 crore for the fiscal year ended March 2018. Its turnover grew 30% to Rs 8,672 crore. Its mining capacity increased from 41.6 million tonnes a year as of March 2014 to 61.6 mtpa in January 2018. Goyal said the company last year made its highest ever contribution to national exchequer — Rs 4,965 crore, or two-and-half times the previous year.